Saturday, Oct. 6 marks a major milestone in the construction of ATL’s North Canopy. All lanes on the Airport’s North roadway will reopen and commercial vehicle traffic – moved to the South roadway during the construction process – will be relocated to the North curb. The focus of canopy construction will now turn to the South roadway, which will see traffic impacts. ATL has taken steps to ease traffic flow. Portions of the North roadway were closed in October 2017 to facilitate the yearlong construction of the North canopy. As scheduled, the entire North roadway will reopen Oct. 6. All commercial vehicle drop-offs – including hotel, off-airport parking and regional commuter shuttles – will be moved from the South to the North roadway. ParkATL, ATL’s on-airport parking shuttle, will pick up passengers outside of Door N3. All changes will be well-marked with signage; additionally, customer service representatives will be on hand to guide guests and answer questions. Portions of the South upper outer roadway will be closed to all traffic Saturday morning, Oct. 6. The first steel columns will be raised on the evening of Oct. 15. To assist Delta Air Lines passengers who utilize the temporary commercial vehicles drop-off area, there will be directional signage along with Airport and airline guest service representatives throughout the North Terminal. • Passengers are urged to seek alternate locations for drop-offs and pickups. • Utilize public transit (MARTA, rideshare, etc.) to ease traffic impacts. 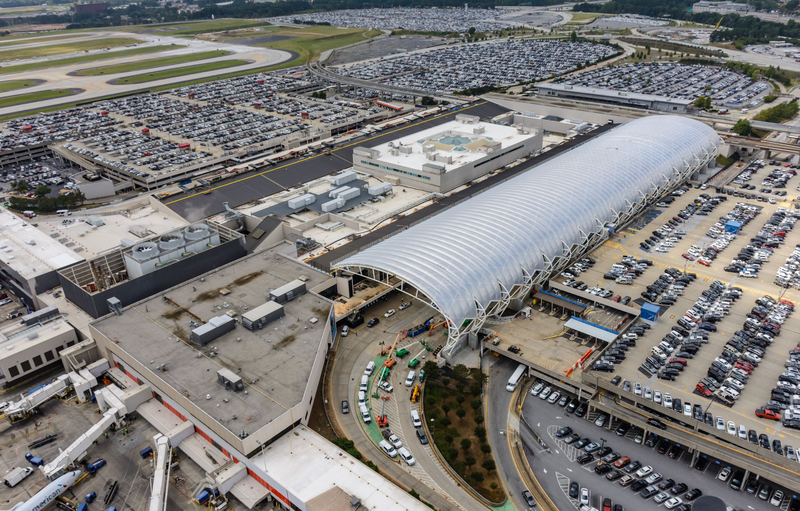 • As a reminder, ATL’s hourly parking lots are close to the terminals and allow for quick, efficient pickups for arriving passengers. • During evening construction periods, lanes in the South lower roadway will allow “in-lane” drop-offs; passengers can exit vehicles from all lanes and not drive to the curb. • Atlanta traffic control officers will be on hand to ensure safe, efficient travel through construction areas. • ATL will provide updates across all its social media channels (Facebook, Twitter, Instagram).